WHAT IS THE DH NorCal Regional Series? The TIRES ratings and detailed DH (Destination Highway) and TE (Twisted Edge) descriptions allow you to find the motorcycle roads in the Bay Area that you don't want to miss according to your riding style. (For an example, though it's not in the Bay Area, see the Feature DH write-up and TIRES numbers.) Once you ride a few DHs, the TIRES numbers will start to make a whole lot of seat-of-your-pants sense and you'll soon be able to compare one DH to another before you even ride them, making sure you don't miss ones suitable to your kind of riding. If you primarily ride in the Bay Area, it's an inexpensive way to make sure you "ride like a local" and don't miss any of the best 62 motorcycle roads there. Though once you see what our system does for you, we think you'll soon be eager to explore more of Northern California. Buying DH BAY AREA is also a great way to get a feel for how Destination Highways books work for you, without committing to a whole book. In the Bay Area for a short time and renting or borrowing a bike for a day or two? DH BAY AREA is the perfect companion since you can pretty much reach any Destination Highways (DH) or Twisted Edge (TE) in a day or two. 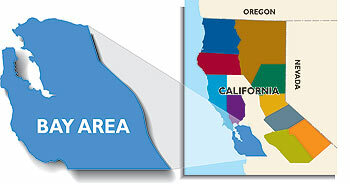 You want to make the best of the precious and limited time you have, so you sure shouldn't waste money on crappy regular maps designed to get you from one major Bay Area city to another in a car as fast as possible on major roads, rather than showing you where the good motorcycle roads are. Want a rider you know to discover what Destination Highways can do for them? Christmas or their birthday coming up? Mother's Day or Father's Day? Or just love them a lot? For just a little coin, drop this puppy on 'em and they'll love you (even more) for life! And you don't have to believe us, this is what reviewers and riders say our books/maps do for them. Watch for Regional Series WINE COUNTRY RUSSIAN COAST & GOLD COUNTRY !!! Our 34,000 mi (54,000 km) of research riding in Northern California, 28,000 mi (46,000 km) in Washington State and 25,000 mi (40,000 km) in BC guarantee that with Destination Highways™ you'll know where all the good riding is and where the services you need are, even if you’ve never ridden in these jurisdictions before. Even most locals in these three places, once they get out of their own area, rely on the same bad maps as everyone else that are designed to get you from one city to the next as quickly as possible on the most major roads available (and damn, are they good at that). Sure, you see some of those side roads that regular maps mostly don't even show as you go by them but you have no idea which ones are crap, or just a waste of time and expensive gas, and which ones are solid gold (and GPS can't help you here). Well not any more (see Testimonials). With Destination Highways™, make the most of your valuable time, rubber and gas on the best possible roads in a given area, rather than wasting them on mediocre roads and/or major highways. All for the price of a few tanks of gas (which you soon won’t be wasting quite so much of any more). "We even had a couple of local guys outside Sacramento ask us where a particular road came from/went to." "We had a couple of locals follow us and ask how we knew about these roads. They'd lived there for years and had never found them! We told numerous locals (including a friendly state trooper) about the book and they all said they were going to run out and buy it!" "I just retired and moved to Eureka, NorCal. I have found roads in the area using your book that even the locals don't know about!" 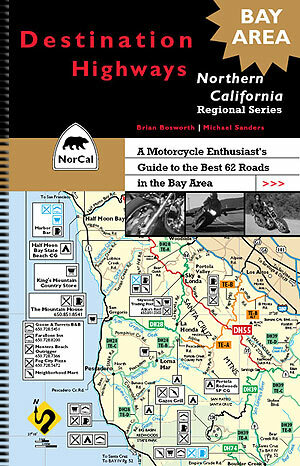 And now with our Companion Maps, it’s even easier than before to ride the best motorcycle roads. So why ride like a tourist, when you can ride like a local?